They have two levels of subscription: the Tasting, which is smaller, and the one I have received, The Classic. Subscriptions are prepaid for one, three, six, or twelve months. 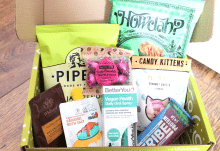 For the Classic box they work out at $39 (around £30), $37, $35 , and $33 per month. As usual, they are priced in dollars, so GBP conversion is according to today’s exchange rate. Obviously this will vary, but it gives you some idea of cost. 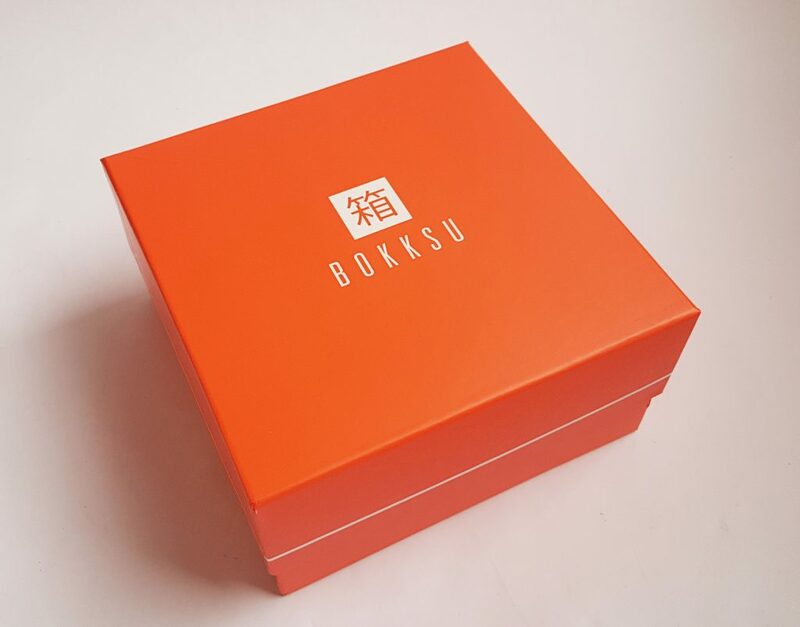 The box comes securely packaged inside a regular cardboard box, so it stays looking nice! 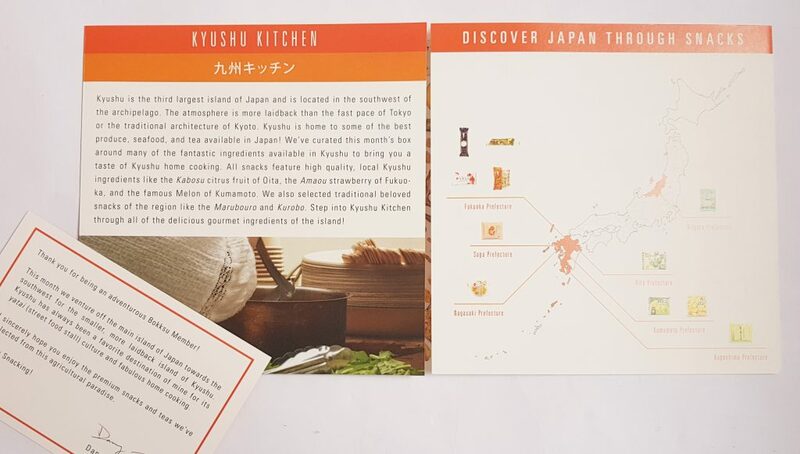 This month’s box features items from Kyushu, the third largest island of Japan. 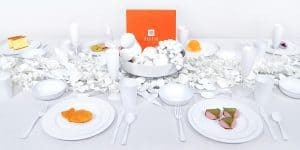 The menu is a double foldout so needs two pictures to see all of it! 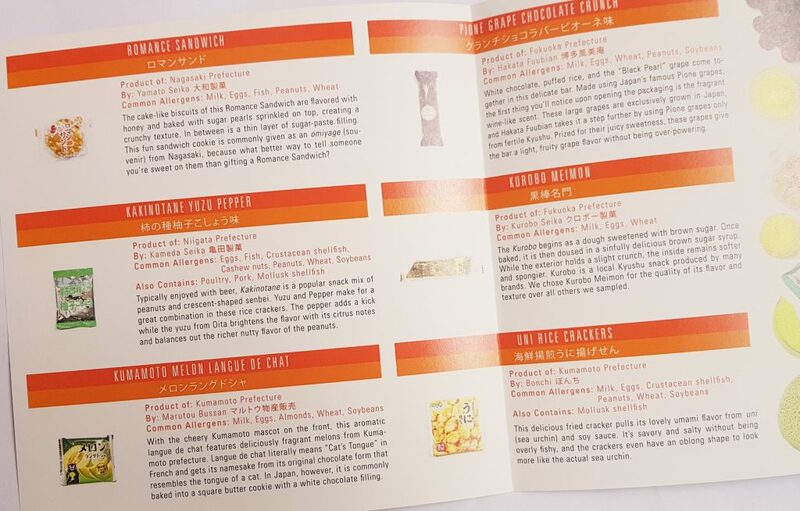 As well as details about the snacks themselves there is also an allergen guide. Very useful for me as I have a seafood allergy! This is called a Romance Cookie. It’s from Nagasaki and is often given as a souvenir. According to the menu, it’s a cake-like sandwich cookie made with honey, filled with sugar paste, and with crunchy sugar pearls on top. I’ve not actually tried this because according to the allergen list it contains fish! I don’t know if this is a misprint, but I’m not taking any chances. It’s a pity because it sounds delicious! 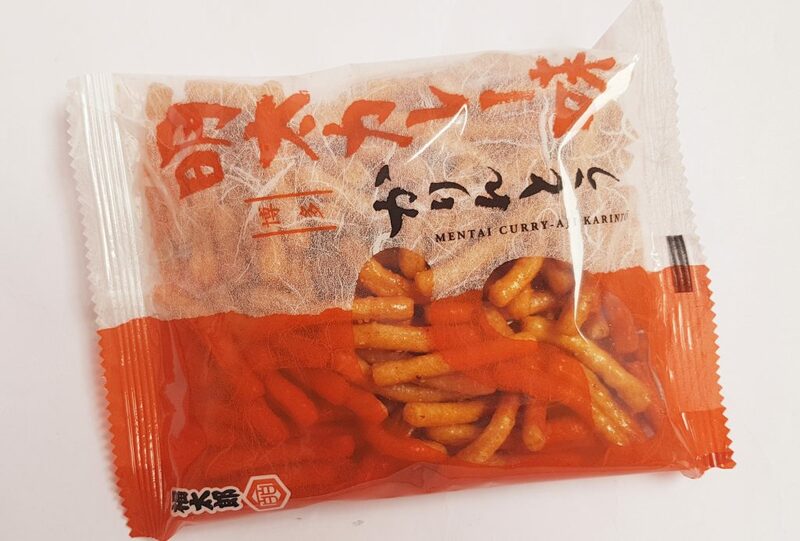 This is a savory snack called Kakinotane Yuzu Pepper. 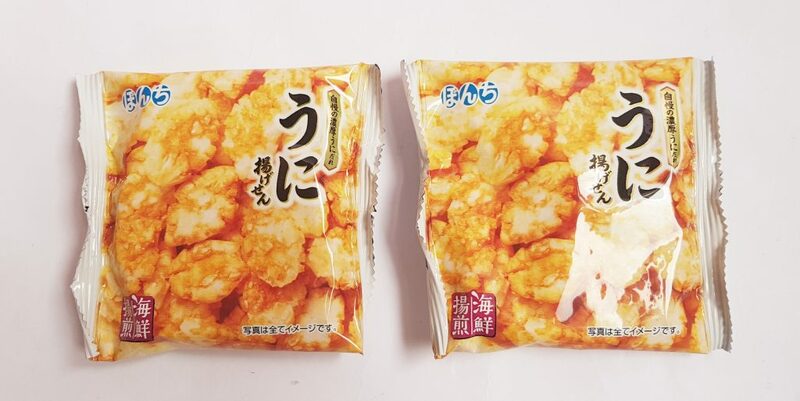 It’s a mix of crescent-shaped senbei (rice crackers) and peanuts and is a popular beer snack. 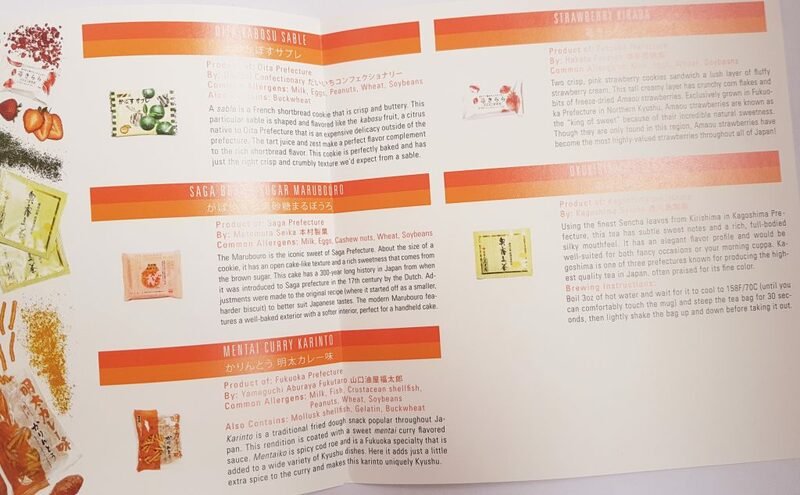 While there’s no mention of shellfish in the flavour name (yuzu, a Japanese citrus, and pepper) according to the allergen list it contains both crustaceans and molluscs, so it’s another one I can’t have. Again, I’m sorry, because I love savory snacks and yuzu pepper sounds like a fantastic combination! I can definitely eat these Kumamoto Langue du Chat! 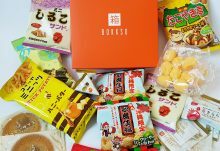 In Japan Langue du Chat cookies are typically square with a white chocolate filling. 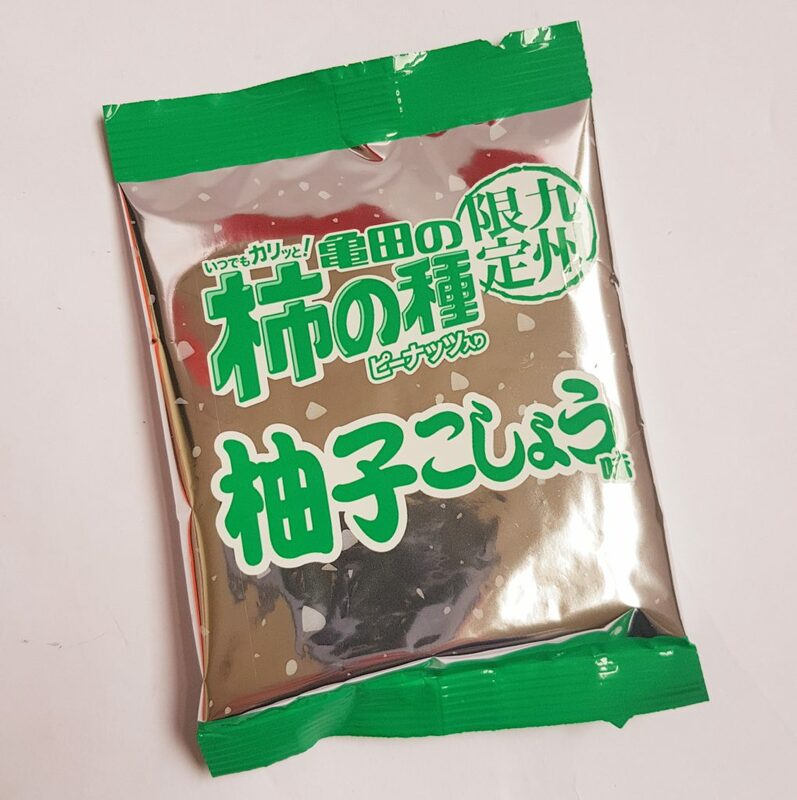 This version contains melon from the Kumamoto prefecture. As in all melon-flavoured things from Japan, the melon taste is pretty strong and distinctive. 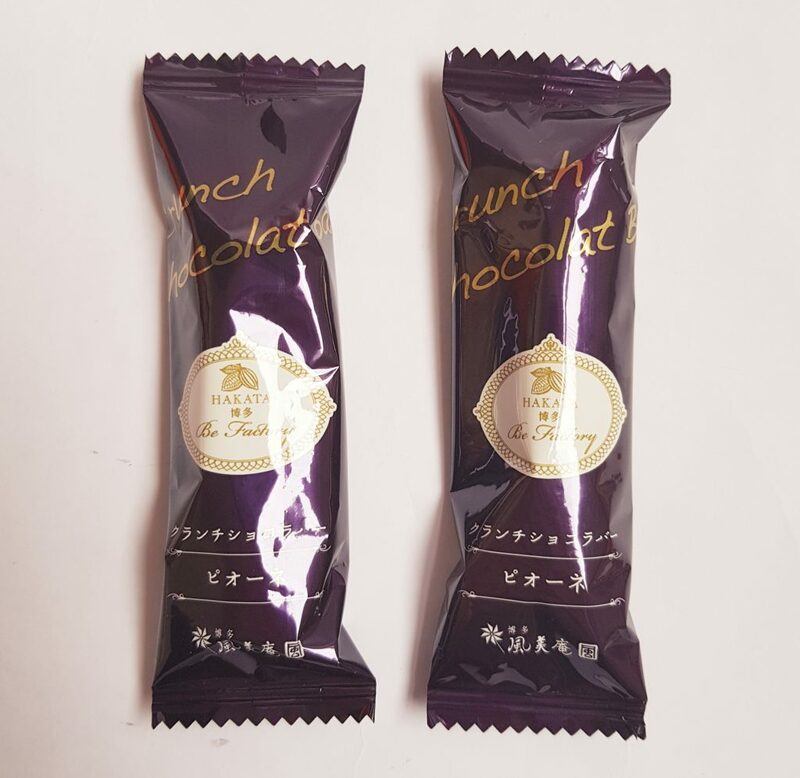 Pione Grape Chocolate Crunch is a puffed rice and white chocolate bar with raisins made from Pione grapes. Very sweet but very nice, and the raisins add a slight tang to the sweetness. These look a bit like biscotti, but they’re actually Kurobo Meimon, a brown sugar cookie. The outside is quite crunchy but the inside stays soft. The brown sugar gives it a nice depth of flavour. Another shellfish snack, Uni Rice Crackers. These fried crackers are light and crispy, and flavoured with sea urchin and soy sauce. This is another Japanese version of a French cookie, a Oita Kabosu Sable, or shortbread cookie. This one is shaped and flavoured like the kabosu fruit, a type of Japanese citrus. These Saga Brown Sugar Marubouro are quite large cookies. They have an almost cake-like texture, and are made with brown sugar. 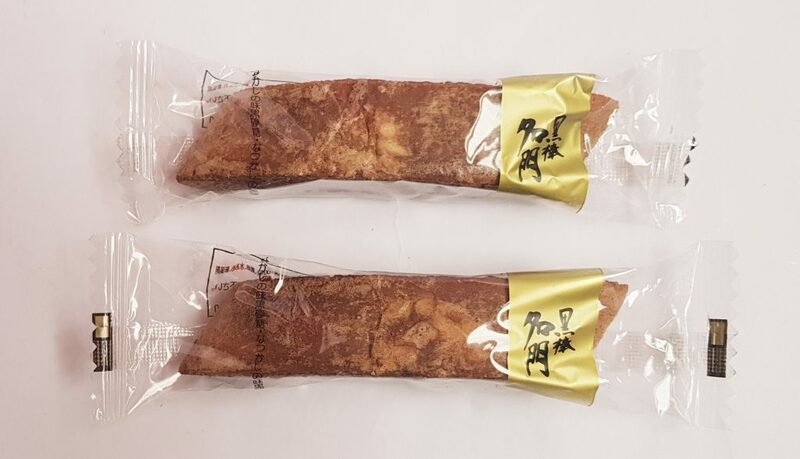 This is a classic treat from the Saga prefecture. One for strawberry fans, these Strawberry Kirara are strawberry cookies filled with strawberry cream with crunchy cornflakes and freeze-dried strawberries! These particular strawberries are called Amaou, and are only grown in the Fukuoka Prefecture. Finally, this month’s tea is Okukirishma Tea, a sencha tea from Kagoshima Prefecture. This region is known for producing some of the finest teas in Japan. Well, this month certainly has a delicious selection, but I’m a little disappointed that all three savory items contains seafood. (Also one of the sweet items, but I’m kind of hoping it’s a misprint!) However all three sound delicious. 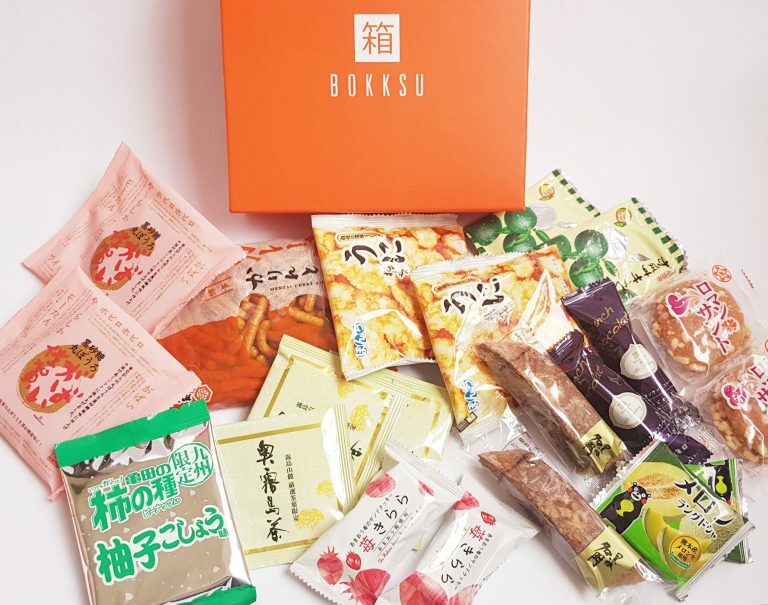 The other items are a nice mixture of flavours, and it’s always fun to have another Japanese langue du chat cookie, and they have such a huge variety. My favourite is the Strawberry Kirara, because of the intense strawberry flavour. 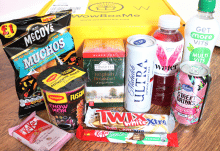 This box isn’t the cheapest, but it really is something of a gourmet selection. There’s no chance you’ll be picking these up anywhere else, and it’s a great opportunity for foodies and unusual flavour enthusiasts to try new flavours. It's always interesting to see the different varieties and flavours from all around Japan. 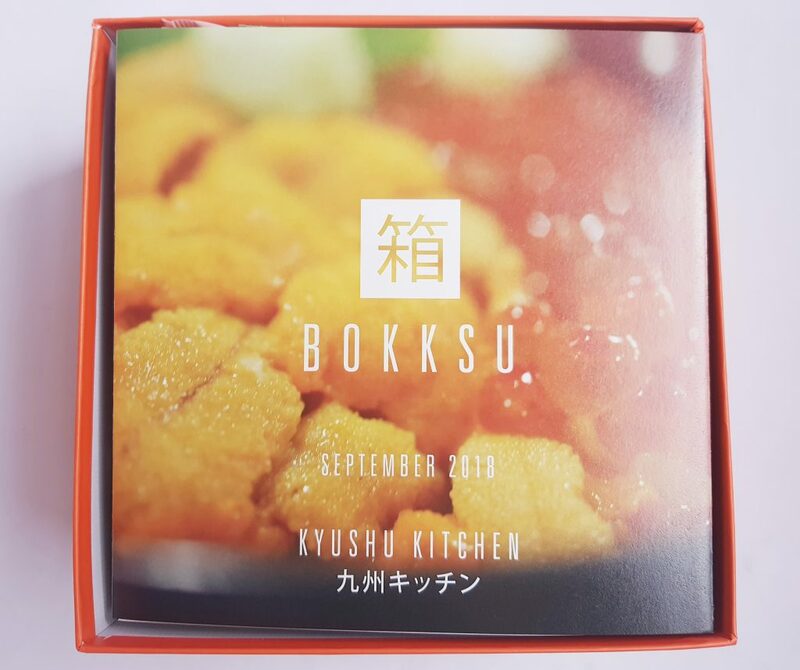 Bokksu is a great way to taste your way through the culture!